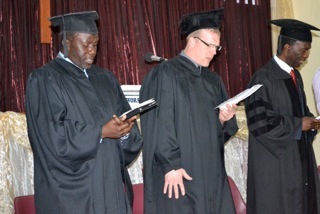 On April 28, 2012, the first graduation of Copperbelt Ministerial College was held. 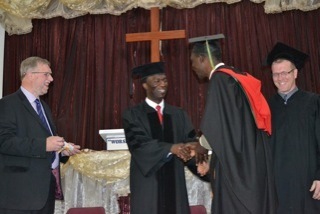 Fourteen students of the college received their Bachelors of Theology Degree. These students began their studies at the college almost five years ago, in July 2007. They received teaching from Reformed Baptist pastors hailing from as close as the host church in Ndola, to as far away as California in the USA. For four years, instructors came in pairs, teaching one week every three months until the cycle of classes was concluded in April 2011. Over the past year, the students have been completing class assignments, taking comprehensive final exams, and working on a thesis paper. The college has been hosted by Grace Reformed Baptist Church of Ndola since its inception, and the leadership and members have worked tirelessly through the years to make the modules run better and better. Our Gracious Heavenly Father has been pleased to bless the efforts of the host church and our lecturers so that the college continues to attract new students, and currently has about 25 men advancing toward completion of their own degrees in due course. The fact that the graduation was held in Ndola Baptist Church, the oldest Baptist church in Zambia, gave an appropriate sense of pathos to the celebrations on Saturday. The service was begun by the reading of Scripture. Katongo Kafuko, the College Administrator, was given this task. He works very hard during each module to see that the students are housed, fed, and supplied with books and notes for the courses, and in general well cared for. Pastor Kabwe Kabwe, Academic Dean of CMC, gave opening remarks and also led the awarding of papers to each graduate. Pastor Choolwe Mweetwa, Principle of CMC, gave an address to the graduates as well. Pastors Kabwe and Mweetwa have been the driving forces behind the college in the Copperbelt since its inception, and it was a blessed sight to see the fruit of their work in Christ’s name. The Reformed Baptist Seminary in Taylors, South Carolina, USA, has graciously given their certification to the courses taught at CMC. This is quite fitting, since many of the lecturers are also faculty members for the same institution. In view of this connection, a letter from the Seminary’s Dean, Dr. Robert Gonzales, Jr., was read by James Williamson, the College Coordinator. In it, the dean emphasized the need to be a lifelong learner, seeking to continually grow in the grace and knowledge of the Lord Jesus Christ. The guest of honor for the graduation was Pastor Austin Walker, a graduate of Westminster Seminary in the US, and a man of over 40 years’ experience in the ministry. He had the lion’s share of the service, exhorting the men in the words of the Apostle Paul to “continue in the things which you have learned and been assured of” (2Tim 3:14). This theme was also emphasized in the opening Scripture reading, the letter from Dean Gonzales, and the principal’s concluding address. Clearly, the Lord had a message for us! Cephas Phiri, one of the top students of the college, gave a fine vote of thanks as a response from the graduates. In addition, a special note of thanks was made to the various lecturers who have come to the college from Zambia, the US, the UK, and elsewhere. Also, a word of thanks was spoken on behalf of Dr. and Mrs. Lazarus Phiri, who have hosted the majority of our visiting lecturers through the years. Though there was regretfully an oversight in getting the word out regarding the graduation, a number of friends and family of the graduates were still on hand for the occasion, for which we are thankful. Hugs and tears and wide smiles filled the fellowship hall where newly graduated men and their families gathered afterward. As well, there was picture taking rivaling the “paparazzi” of the most exciting wedding, as each graduate wanted a combination of different pictures with other graduates, with his family, with his principle and dean, with the guest of honor, etc.